What Is Dynamic Integrated Golf Simulation? “Repetitive golf related actions, under simulated playing conditions including realistic mental challenges and tension”. Commonly known as “Practice”! However, we will explain in this article how very much different D.I.G.S. is from the normal “Golf Practice Routine”. Why is it we can hit a multitude of good golf shots during practice on the Putting Green, Golf Short Game & Bunker practice area, and golf driving ranges, but yet when we get out on the Golf Course – - we sometimes just can’t buy a good hit? We normally have very little stress or anxiety while practicing, and we hit multiple shots the same way with the same club. We are bound to get a number of good shots in a relatively short period of time, Right? We can relax and focus on each shot without anybody watching us, and with virtually no mental pressure. We know the shot doesn’t count! No one golf shot will affect our golf scores, nor winning or losing the tournament or even the side bet with our playing partners. We just wish we could take that “A” game to the playing course! There is considerable apprehension on the course, particularly on the 1st Tee Box, because we haven’t just hit 4 or 5 shots a minute ago like the one we are now facing. This time we only have one chance to get it right, with everybody watching! Stressful! So what do we do? We get all tensed up and our golf swing becomes way too fast in order to smack that ball and relieve our tension! Boom! We hit it fat, top it, or shank it. Frustration City! Now we get all messed up and lose our confidence about hitting the next shot. Here comes another lousy 18-Hole score. We need to bring stress, apprehension and tension to our golf practice drills to simulate playing conditions. Make practicing even more difficult and challenging than playing the actual course! This is Golf Simulation. Bring relaxation, focus, and confidence to the playing course. Again, this is Golf Simulation. That sounds simple enough, right? So how do we bring stress, apprehension and tension to the practice arena, similar to what we have been experiencing on the golf course? 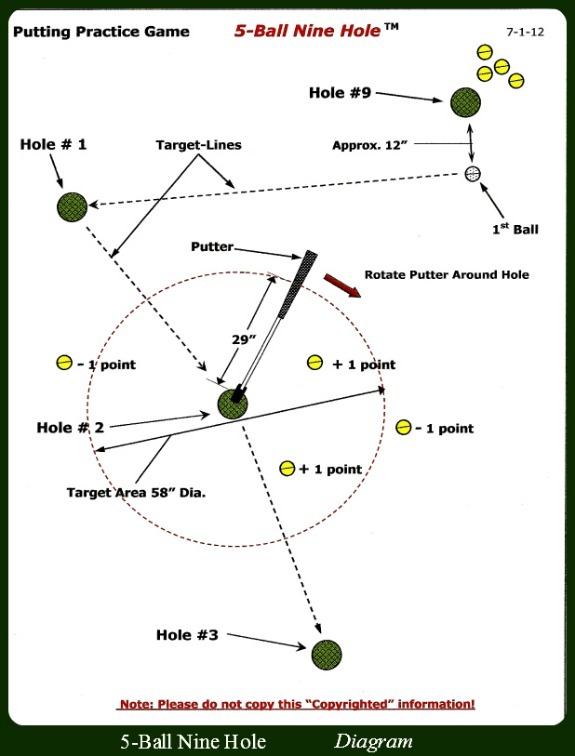 Devise a series of Golf Drills & Competitive Golf Practice Games which include stress, apprehension and tension. Score and record the results! You can then set goals to compete against yourself and your previous practice scores. Stretch yourself! Got Golf Simulation? Perform these drills and practice games with your playing partners and attach some sort of wager to the scores, such as; loser buys breakfast, 50 cents per Hole, etc. This makes practice fun! This sounds easy, but you will find that with your partners watching and with rewards and/or penalties to follow, there will be stress, apprehension and tension involved! You will find that after several of these competitive sessions, you will begin conditioning yourself to actual playing conditions. Another benefit is that by keeping records of your golf scores, and graphing the results; you will see trends of improving your game and increasing your confidence! Your Golf Score Card will look much better! So now how do we Bring relaxation, focus, and confidence to the playing course, similar to what we have been experiencing in the practice arena? By pre-conditioning yourself to stress, apprehension and tension during practice sessions, actual play on the course will seem far less intimidating. Now you are experiencing Golf Simulation! Adam is a “Mental Golf Coach” and a single digit golfer. Hope this article helps you to become a better, happier golfer!